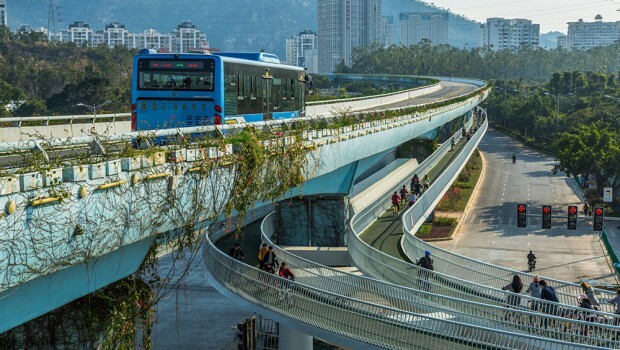 This month, the city of Xiamen has inaugurated its elevated bicycle skyway that stands as the longest infrastructure type of the world. The Danish designer firm Dissing + Weitling with China Construction Steel Structure Corporation (CSCEC Steel Structure) have succeeded to complete in six months the elevated cycle path project located in the southeastern Fujian, in China. Long as 7.6 kilometers, the infrastructure is the world’s longest bike path. It is connected to eleven bus stops with the public transportation running along the lane as well as two metro stops. The cycle path includes 253 parking spaces and accommodates around 2000 bikers an hour. Gates at the entrance control rider’s number in order to avoid the infrastructure to be crowded. 30.000 lights have been set up to allow riding at night.